This is why I love makeup brushes: Every once in a while a new one comes along and it’s really, really different than everything else on the market and exciting. Which is a feat, honestly, because there are a lot of brushes on the market, and a lot of same. 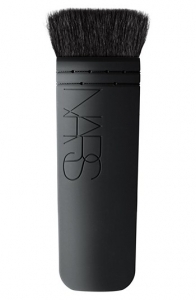 But the NARS #23 Wet/Dry Blush Brush, which retails for $42, is special. Let’s start with the fact it’s from NARS, a brand that makes spectacularly beautiful artistic makeup brushes–from its perennially sold out Ita Kabuki Brush to its Yachiyo kabuki with the organic wisteria handle to the substantial Botan Kabuki. The first two retail for $55, with the latter going for $70. 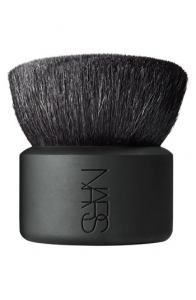 Now, some of NARS brushes are better performers than others, but it’s safe to say that NARS takes brushes seriously, as we do we here at My Brush Betty. 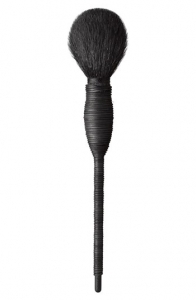 The #23 Wet/Dry Blush Brush is a firm, compact domed nylon brush that is sold as an accompaniment to the NARS Dual-Intensity Blush. That is a $45 dual-pack blush that can used wet or dry and gives a natural lustrous glistening effect that beauty bloggers are just gushing over. Much like they did NARS’ Dual-Intensity Eyeshadows. The #23 is a unique accompaniment in that–surprisingly–there really aren’t that many compact domed brushes on the market with this firm and tight a toe. You can find a lot of compact flat tops, but not so much with the domes. And that’s what makes this brush the perfect replacement for your middle finger (but better) when blending color in small circles on the cheeks. 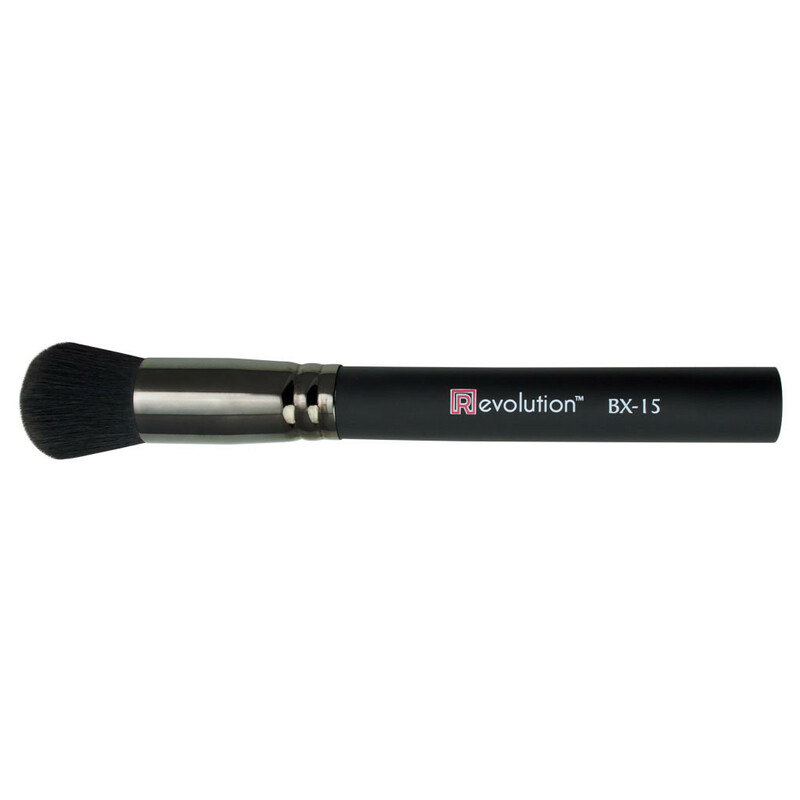 The only brush I found that came close was Royal & Langnickel’s Revolution BX-15 ($37.99), although the NARS brush looks a tad tighter in the toe. Now, the NARS #23 is very good at the task it’s sold for, which is wet or dry blush. Being nylon, the pickup on this brush for powder is nice, but on the lower side, but that’s good for this purpose. The dry look is more ethereal; the wet, more dramatic in its skin-like luminosity. 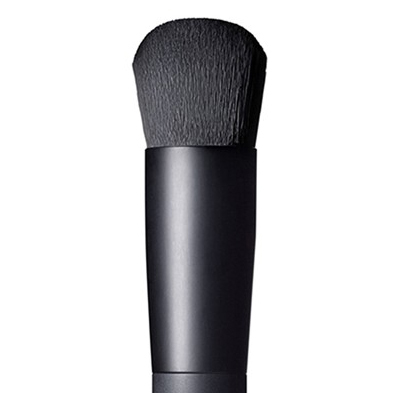 But I have to confess, I’ve also found this brush to be really good for applying liquid foundation, where it provides a similar but more natural finish than some tight-toed flat-top kabukis that are so popular, such as the Shiseido Perfect Foundation Brush. Because the #23 toe is small, you also have a nice level of control and can get into crevices, but it’s not so small that it takes too long to get the job done, which can be an issue with the Shiseido Perfect Foundation Brush … a brush that also has a tiny handle in comparison to the NARS. In some ways, the NARS #23 brush also reminds me of another cheek blusher that found its way to being rebranded as a multipurpose brush because it was such an all-star performer. 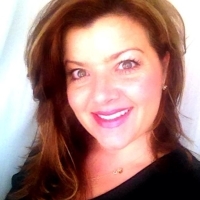 That brush, the Sonia Kashuk Flat Top Multipurpose Brush is now in the My Brush Betty Hall of Fame. Th NARS #23 really is good at anything you might naturally use your middle finger for in application, so blush (dry, wet or cream), foundation, blending, highlighting. I personally think the #23 is a good one to have in your collection, and I’ve found myself reaching for it again and again.